Many cars and trucks today come with “premium” brand audio systems – Bose, JBL, and Harman/Kardon are some of the most common – and while they usually cost extra, they rarely deliver the performance folks expect. Usually the amplifier is underpowered (good amps cost more, and automakers are convinced that good sound doesn’t sell cars). Often the speakers have some nonlinearities – some notes are too loud, some are too quiet. Musicar has the answer. 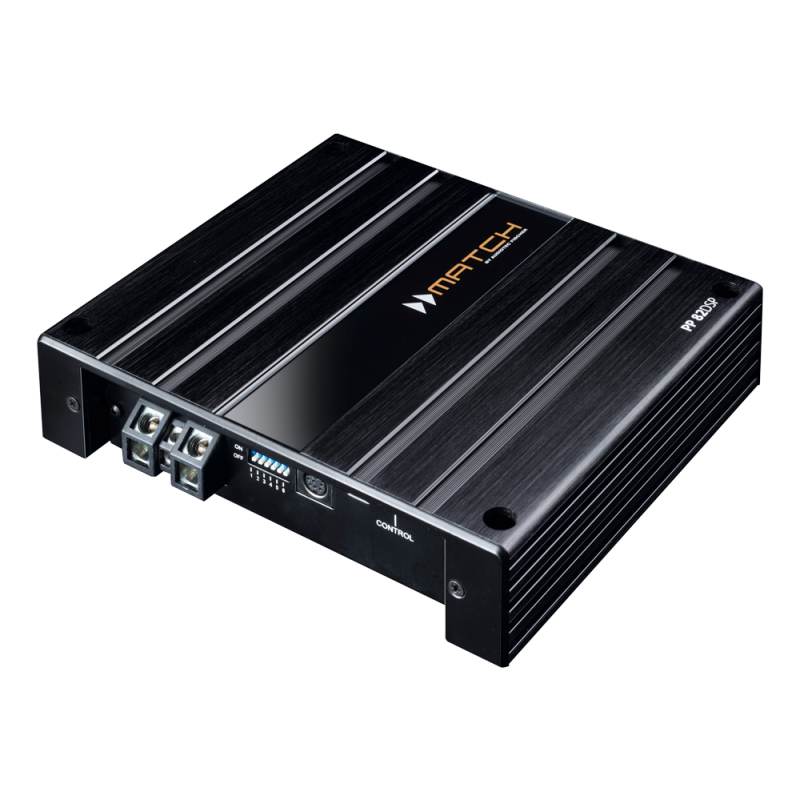 Our new DSP amplifier from Audiotec Fischer of Germany lets us upgrade the power to the speakers, and improve their linearity! It’s like getting more power out of the motor and getting a tire-and-suspension upgrade at the same time! This device gets us 55 watts for each of 8 channels, and it also gives us a state-of-the-art 56-bit acoustic processor. We can control each speaker’s response, we can control when each speaker’s output arrives at the driver’s head, we can control exactly which notes come out of each speaker. You will hear details in your music you may never have heard before – more detailed highs, clearer vocals, and better bass than you’ve ever heard from a factory subwoofer. We use our advanced acoustic measurement equipment to tune literally dozens and dozens of adjustments to optimize your system for you. Since we’re in a car, our physical relationship to the speakers – the relative distances and the speaker’s orientations – are not optimal. Without significant modifications to the car, huge compromises are involved – some speakers are too close, some are too far away, some are aimed right at us and others are aimed away from us. Some folks want to modify the car to compensate for these flaws, and those projects are fun to execute – but we know that most folks want their vehicle to look and function just as it already does. 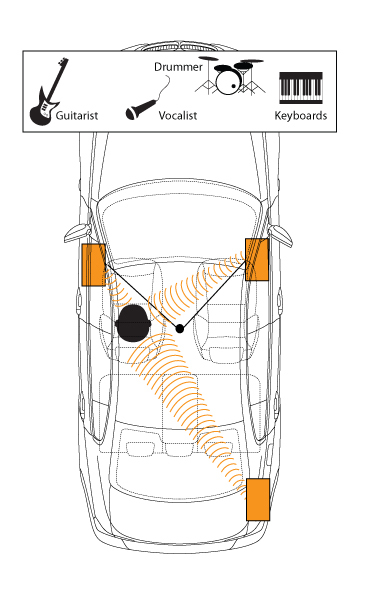 Using DSP-powered audio tuning features, we are capable of compensating for differing speaker distances and orientations – getting startlingly realistic and musical results without changing the appearance of the vehicle. This compensation happens in both the time and amplitude domains – we are actually making up for the different arrival times as well as the different apparent loudnesses of each speaker! We can also compensate for the acoustic response of the cabin, so that the music is balanced and present at all notes, without undue attenuation or emphasis. Even though some speakers are closer than others, a Musicar DSP Upgrade makes the speakers sound as if you’re sitting in the center of the car. The stage is balanced – wide and continuous all the way across without holes. For more on how this works, see our “What Sounds Right” page here. These are invisible, reversible installations – they can go back to stock in future if desired. Installation and tuning can be performed in a single day at our Portland facility. Please contact us to find out if your vehicle is a candidate.